We had an 11.10 am flight to Xian to catch today so we set the alarm for 7 am. I was wide awake at 6 am so I commenced folding laundry; that’s dirty laundry mind you because it fits better in backpacks when neatly folded! Steve woke and went a bought a litre of milk (8.90 Yuan, about $1.10 AUD) in the shop downstairs so we could eat our own cereal and we proceeded with our regular routine of packing our backpacks and scanning the room for lost items. We have become particularly careful at scanning since Steve lost his head torch in Hanoi. The hotel cleaning staff would have found it for sure before the room was occupied next but did not admit to finding it – goodbye head torch. Anyway, we checked out of the Captain Youth Hostel on Yan An Road. The room we had stayed in for 3 nights offered one double bed and one king single; the boys slept top and tale. We had a good shower, which is always a bonus; broadband internet and decent pillows; such simple things that made the hostel a good pick for stay in Shanghai. Only thing that would have made the room better would have been a mini fridge. Out on the main road we attempted to hail a taxi. First taxi guy wasn’t at all interested in taking us to the closest train station because it obviously wasn’t a big enough fare for him. Nevermind, the next guy was more than happy to pick us up but did take us to a different station slightly further than we had intended; but it was at least on the same train line. The free map we had gotten from the airport had a map of the train line in English and in Chinese so this was of great use when trying to communicate with the taxi driver. At the train station we got a metro train on Line 2 to Longyang Station. We got off here and walked to the station to catch the Maglev train – the ultra cool and very fast 431km magnetic levitation train that we had bought a return ticket for at the airport when we had arrived. 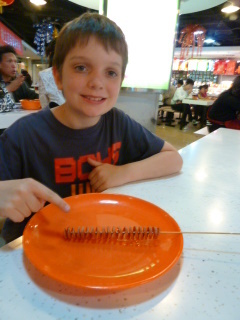 We only had to buy 3 tickets for any of the trains in Shanghai as Patrick was free! The best thing about the Maglev train is the speed and that it cuts out stopping at over 10 stations on the way to the airport! Love that. We arrived at the airport and found our way to the China Eastern check-in area and went through the process to get ourselves seats. Considering the number of flights we have ticked off in the last few months, I am now expert on our preferred seating. I do not like to sit over the wing, what is the point when you pay to fly, want a window seat to enjoy a bird’s eye view but then can’t see anything! So I ask for seats in front or behind the wing. Plus, I prefer that we are seated 2 and 2; not 3 and 1. If we are seated 2 and 2 (people together) then there are 2 windows seats, one window for each kid and a seat for an adult to sit beside them and assist at meal times. If we are the window and middle seat in a row of three seats, then we only have to scoot past one stranger to get to the toilet. Never an issue. That is how it worked today. We made it through a number of security checks; grabbed some caffeine for us and juice for kids and then boarded a bus which drove us onto the tarmac a good distance to our awaiting plane. We boarded and then sat on the ground an extra 30 minutes for some unknown reason. This was a great opportunity to revise some reading and maths with Patrick. Finally up in the air and off to Xian. 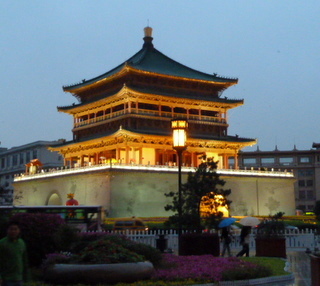 When we had to narrow down the places we really wanted to see in China, Xian was always on the top of my list. Those terracotta warriors are true symbols of China to me and I was really keen to see them. We enjoyed a good flight to Xian and were told that the temperature on arrival was 14 C – a bit chilly. We pulled out our jackets at the airport and set off to find a way into the city to our hotel. The tourism information office at the airport informed us that with two children and all our bags we really should take a taxi or the airport shuttle service that they could book for us at 200 Yuan and that it was one hour to get to the city. When I stated that we were told a taxi would be about 100 Yuan, they quickly dismissed this information (maybe LP was out of date?). We informed them that we weren’t in a hurry and the bus would be fine. As it turned out we found the bus quite easily, bought tickets for 3 only and it went directly to the Melody Hotel right downtown and right around the corner from our hotel. Only problem was our hotel wasn’t marked so well and we missed it initially and had to backtrack to find it after asking two other hotels where it was! All settled into the Xian Citadine Central at last. The room had a large bed, sofa bed, fridge, microwave, cooktop, kettle and toaster! Best thing the place has a laundry and I spent a couple of hours after dinner using the washer and dryer to clean up our clothes – beats scrubbing them in the bathtub , wringing them out in a towel and then finding a place to hang everything! This works well but gets a little tiring after awhile. Each token for the washer and dryer was 20 yuan – so cost about $8 to wash and dry all our clothes at once. Kind of expensive but like I said, beats manual labour at times! We headed out into Xian. Found a Starbucks for some more caffeine and took in the surroundings. Downtown Xian near the Bell Tower and Drum Tower is crazy! Right beside the ancient towers are shopping malls, Starbucks, McDonalds, Haagen Daaz Icecream and people …people everywhere! Thankfully there are underground passenger tunnels so you can avoid walking across the roads and also avoid the chilly and now drizzly weather. Dinner was on the agenda so we headed through the tunnels and popped up on the street outside a large shopping mall. Malls are usually good for food courts and we found one here. I think I have mentioned before that many food courts in Asia use a card system. You buy a card; put any amount of money on it; take it to the particular vendor where you wish to purchase food; they scan it and deduct the cost of your item. When you are finished you can return your card to the selling counter and they will reimburse any funds on the card or you keep the card for next time with the credit on it. The food court was busy, offered a good variety of yummy cheap food and looked clean and hygienic. It was a little noisy but we have eaten in louder places in the last week! Steve and I bought these pancake type things. 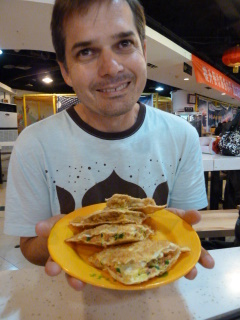 We have no idea what they are but they were great and only cost us 8 Yuan (about $1). The boys both had large plates of fried rice for 10 Yuan each and then a sausage on a stick for 3 Yuan each. Steve and I polished off their leftovers and enjoyed a 8 Yuan beer! Got to love those prices. 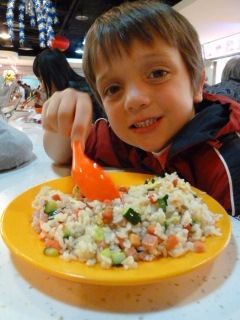 We intend to go back to the food court for dinner tomorrow night since there was a lot of different food to try. Back to the room and we settled in for the night. We were looking forward to a sleep in and a quiet day exploring Xian at our own pace the next day. It was also going to be a special day – our 12th wedding anniversary! Happy Anniversary! It is great reading your updates. Happy Anniversary guys -sorry I missed it.